Home Musicians Brymo Bio, History, Career Achievements, What Is He Up To Now? The son of a carpenter and a petty trader, Brymo owes his meteoric rise to prominence to his mother who was actually the first person that inspired him to create music. According to the singer, his mother loves fuji songs as much as she loves him and was very good at singing them with excitement. It was never his childhood dream to become a singer or a songwriter. His first love was football which he developed a strong interest in from his early years to the time he started his secondary school education. It was during his years in the secondary school that Brymo, after a deep thought, settled to abandon football and pursue a career in music. With the inspiration he got from his mother and consistent commitment to the course, the singer finally launched his music career in 1999. Today, the folk/pop/afrobeat singer has risen to become a force to reckon with in the Nigerian music industry and beyond, having collaborated with high-profile singers like M.I, Jesse Jagz, Ice Prince, David Pryse, among others. The singing sensation’s real name is Olawale Ashimi. He was born on May 9, 1986, in Okokomaiko, Ojo, Lagos State, to a carpenter father and petty trader mother who are of Awori and Egun ancestry respectively. The only child of his parents, Brymo was raised in Okokomaiko, Ojo, Lagos state where he spent some time at an Islamic school. He was later enrolled at Aganju Aka Primary School, after which he switched to Japual Primary School and eventually completed his elementary school education. While growing Brymo was very stubborn and notorious for getting into numerous fights with other children within his locality. But despite his unruly behavior, he had a soft spot for football and was equally good at it. He later dropped the sports for music after graduating from secondary school. Brymo was offered an admission to study zoology at Lagos State University (LASU) but he abandoned his studies to give his musical ambition a chase after his second year. It is very safe to say that Brymo stands out as one of Africa’s most successful artists with so many accomplishments ahead of them. Despite his young age, he has achieved so much within the little time he has spent in the music community as a singer. From his songs to his studio albums, Brymo has won many hearts as well as praises from his contemporaries for his outstanding career. As we mentioned earlier, the folk maestro rolled out his music career in 1999 while he was in secondary school. It was also in the same year that he recorded his debut single titled Future. Three years later, Brymo and his friends formed a musical group called The Aliens. The group, however, disbanded in 2005 following a misunderstanding that hit their camp in 2004. Singer Brymo has successfully recorded eight wonderful studio albums, which were released between 2007 to 2018. The superstar’s debut album titled: “Brymstone” was released in 2007 while the rest – “TheSonOfaKapenta,” “Merchants,” “Dealers & Slaves,” “Tabula Rasa,” “Klĭtôrĭs,” and “Oṣó” – were launched in 2012, 2013, 2014, 2016, and 2018 respectively. Over the years, Brymo’s songs are universally acclaimed for dealing on a whole lot of issues that Nigerians can easily relate to. They most times touch on subjects like chaos in the political system, social injustice as well as other societal challenges that are prevalent in the country. The singer has also shared the stage with several Nigerian musicians. He is known to have featured on Ice Prince’s hit single, Oleku, which was released in 2011 from the latter’s first studio album Everybody Loves Ice Prince. Brymo’s musical talent also opened up an opportunity for him to band together with afrobeat singer Jesse Jagz. The latter got him featured on his song titled: Love You. A look at Ashimi’s musical history shows he was previously signed to the record label, Chocolate City. His stint with the label began in 2010 and ended in 2013 when he breached his contract with them. 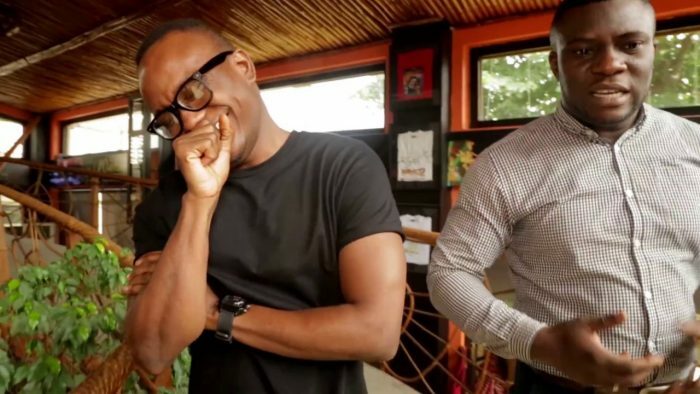 According to information online, Brymo’s gallant entry into Chocolate City was facilitated by M.I, who was supposedly influential at the time. Ashimi is still in the business of expressing his thoughts and feelings through lyrics and sound. He currently performs at top shows on big stages across Africa. His latest album “Oṣó” which was released in 2018 is a clear indication that the pop/rock singer is still pushing his way to the pinnacle of the music industry.